It’s not that often I get to spend a Friday evening in a church crypt watching one of Shakespeare’s most famous plays being performed less than three feet away so when that opportunity came up I didn’t hesitate. Having written a preview for Londonist, I was unable to attend the press night but managed to get tickets for the penultimate night. 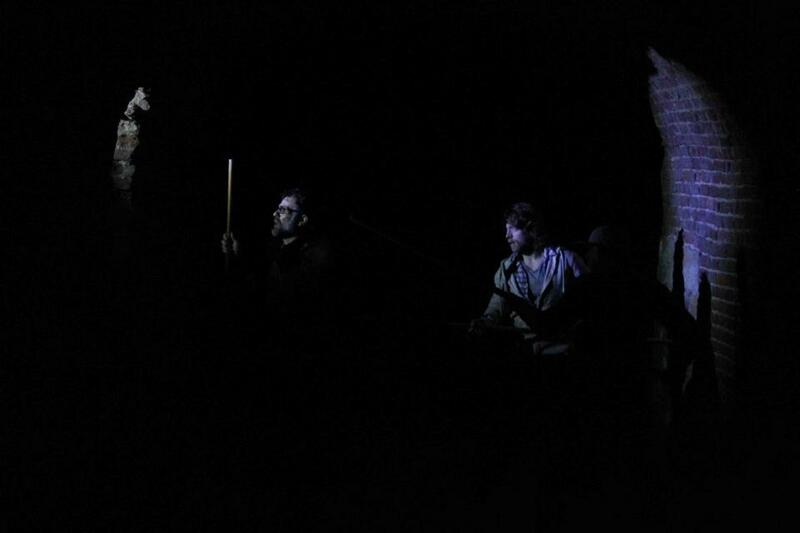 The Actors’ Temple company chose an unusual venue – the crypt of St Andrew in Holborn – a warren of stark brick arches and rooms we were ushered through in darkness accompanied by a menacing drum beat. For the opening scene where the ghost of the late King of Denmark makes its first appearance to Francisco, Barnardo, Horatio and Marcellus, the tiny audience of 50 people were arrayed on a platform in the shadows as we watched the men plead with a silent ghost illuminated only by cold moonlight. The eponymous Hamlet played by Actors’ Temple founder and owner Mark Wakeling, responds to Gary Condes King Claudius’s demands that he cease his ‘unmanly’ mourning of his dead father with the barest assent over his shoulder as he fusses over Ophelia, his scorn for his uncle insultingly apparent. Meanwhile, Tim Duthie’s Laertes is the straight-up-the-line perfect son, taking the time to warn his sister not to pay too much attention to Hamlet’s flirting. For the scene where Hamlet finally meets the ghost of his dead father, we are lined up against the wall of the crypt, watching the catalyst of his descent from grief-stricken son to scheming prince under a pretence of madness. His anger is palpable, he fights off his friends when they try to prevent him leaving with the ghost. Company co-owner Ellie Zeegan’s Ophelia seems to suffer the most at Hamlet’s desperation for revenge and is the misplaced focus of his anger at his mother, Gertrude. She’s played with a lovely and touching innocence; her father, Ron Sudhir Scala as Polonius, has forbidden her from seeing Hamlet but he visits her ‘with a look so piteous in purport/As if he had been loosed out of hell’, a frightening and confusing experience for her. This doesn’t stop Polonius and the King later using Ophelia to spy on Hamlet which leads to a brutal scene between the two former sweethearts. Ophelia’s terrified sobs as Hamlet by turns screams at her, insults her, throws her to the ground and manhandles her are heart-wrenching and seeing all this happen right on the floor in front of you is both discomforting but compelling. When he finally leaves her crying in fear and panic I realised I had been holding my breath and watching through my fingers with tears in my eyes. Hamlet’s friends Rosencrantz and Guildenstern (themselves the stars in Tom Stoppard’s play of the same name in which the two characters meander about pondering the reason for their existence while the play of Hamlet happens around them) are played by James Alexandrou and John Pickard respectively – both of whom dedicated Eastenders fans may be familiar with. The former also does a cracking stint as a gravedigger, flinging bones about with abandon. The players, used as a device by Hamlet to expose his uncle’s guilt, are a free-wheeling painted bunch whose enactment of his father’s death and his mother Gertrude’s betrayal complete with much squealing, cross-dressing and drama, raises more than a few giggles from the audience. 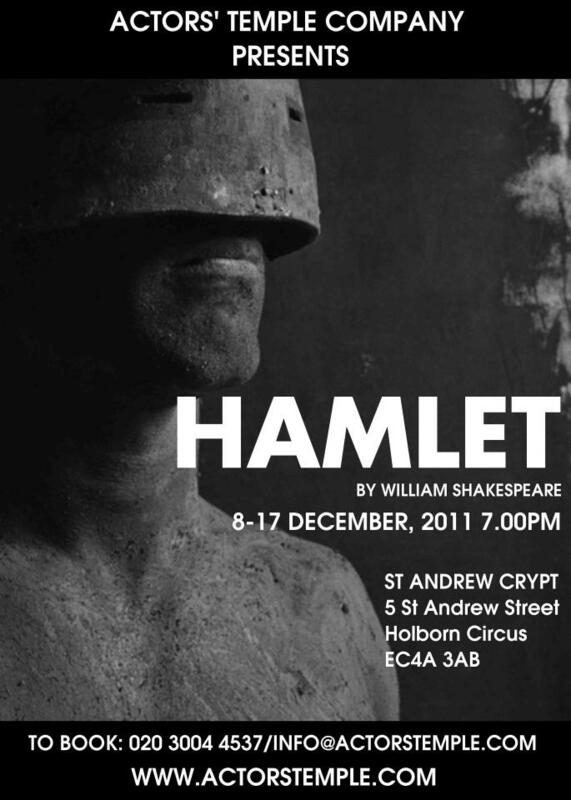 Hamlet himself lurks at the very back of the crypt, watching Claudius’ face avidly for signs of guilt. There was so much to look at in this scene that it was hard to know whether to watch the play-within-the-play, Hamlet virtually exploding with excitement at being right or Gertrude and Claudius bethroned and looking on in horror and slow dawning of realisation at the scene in front of them. Gertrude’s subsequent summons of Hamlet to her room to discuss events leads to his murder of Polonius and his exile to England. The scene where Ophelia’s madness following the death of her father is exposed is haunting – she’s led in on the end of a rope to speak with the king and queen, handing out herbs and flowers to all present, muttering and singing to herself. Her later drowning is announced by the queen just as a furious Laertes (who does a nice line in sentences beginning with quiet menace which finish with rage-filled shouts) is demanding to know what happened to Polonius and plotting Hamlet’s death. The famous ‘alas poor Yorick’ scene is handled brilliantly with a drunken Hamlet swathed in a cloak and hood crawling around on the floor bantering with the gravediggers. Mark Wakeling delivers what’s probably one of the best-known theatrical quotes while giggling hysterically and clutching a bottle. His reappearance sparks another fit of rage from Laertes who holds him responsible for Ophelia’s death. The final scene in the court swirls around us, Hamlet and Laertes duel while Gertrude inadvertently drinks the poisoned wine meant for her son. Claudius’s anguished shout as she dies is truly spine-chilling. It was an amazing and compelling performance, the whole thing felt raw but beautifully executed and with real emotion. Many of the audience (myself included) were brushing away tears at the end of the play. The actors manage to get under our skin in a way that’s facilitated by the surroundings – the audience is so close it’s more like being part of the play than a spectator. Despite being over three hours long, the time rushed past and I can honestly say I’ve never enjoyed a play so much as this one. The Actors’ Temple are definitely on my list of must-see-agains. Visit their website for details of future performances and their page on Facebook.